Quiet. The steady tick of the kitchen clock. Frost. Blanket. Clear dawn. 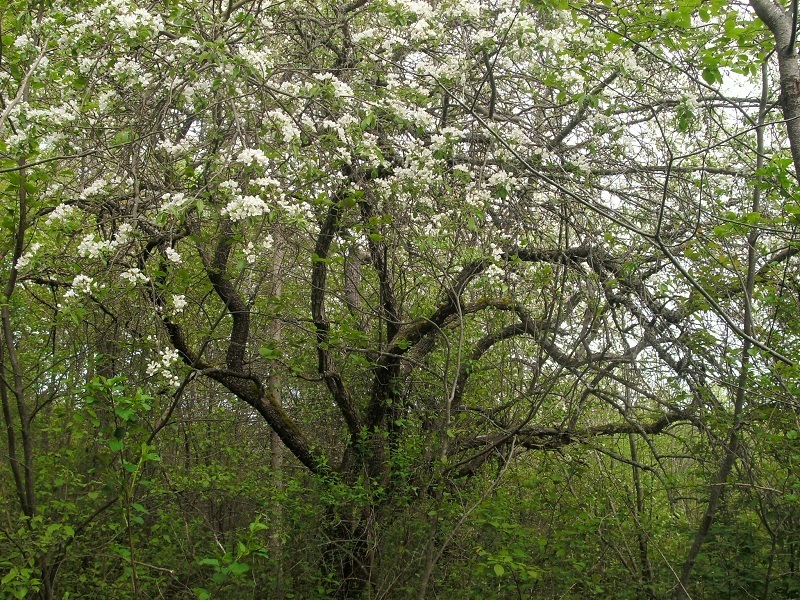 My first spring at the cabin, two years ago when I was just visiting, making plans, feeling overwhelmed and exhilarated, I became aware of a few large, old apple trees on the property. Three are along the drive at the top edge of the gully. They are unkempt with many dead, falling down branches, but when I first saw them blooming—beautiful. Apple trees along the drive. One day I got excited when I spotted apple blossoms towering above a thick growth of alders and who-knows-what on the far side of the front field, so across the field, alongside the marsh, and into the jungle I went to find one of the biggest apple trees I’ve ever seen. Almost all the blossoms were beyond reach, way overhead, and the trunk of the tree was thick, rigid, rippled and mossy, lined with pockmarks. Below the tree’s spread, the forest was dark and quiet. 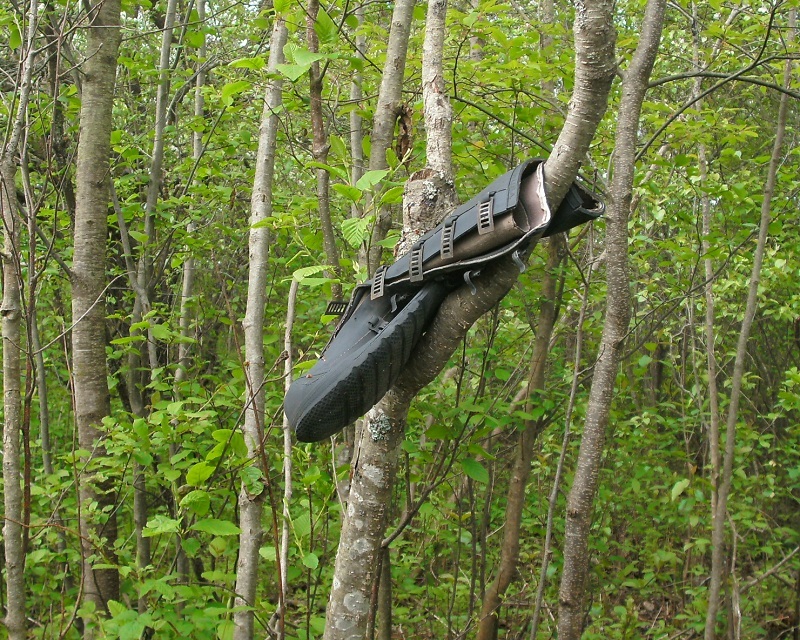 I marked the narrow pathway through the undergrowth into the tree with a pair of large galoshes I had found in the garage. Without trail indicators, I figured in the fall I might not be able to find my way back to the tree, to taste the apples. But when I did find my way back, the apples from the ancient tree were few and mostly beyond reach. And the apples from the trees along the drive lacked flavor. 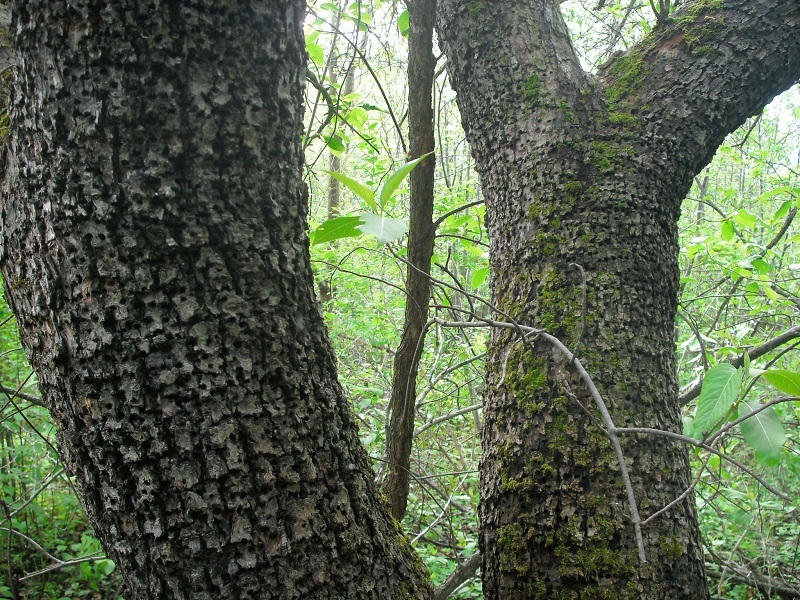 The old apple tree in the woods. Frost again. Burning a downed beech limb in the woodstove. It’s from a dead tree just east of the creek, beyond the garage, and must have blown down during one of those high winds last week, though I just noticed it yesterday. 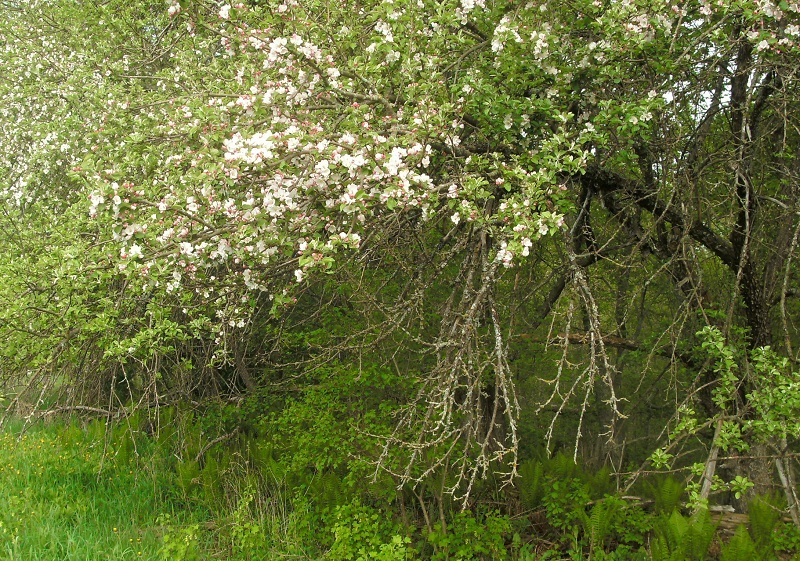 I love wild apple trees, the spring blossoms intoxicating the air, the autumn fruit crisp and sweet. Some wild fruit is not so good, of course, best left for the deer, but some … oh my. My favorite apple is not the Fuji or the Honeycrisp, it is an apple with no name that comes from a tree behind my friend’s pole barn. His favorite apple comes from a tree next to his house with branches so close it nearly reaches in. The trunk of that big old apple tree. A soft rain falling. I forgot to set the alarm, so simply woke to a grey light. Elliott’s lack of fuss in the morning is quite remarkable. Apple trees are everywhere and anywhere in this part of the U.P., along the road, alongside ditches, in people’s yards, behind barns, in fields, next to the post office. There are whole blooming orchards of apples, some tended, some not, the ones that are not perhaps just remnants of orchards crowded out and crowded in so the blooms spill out over the tops of tag alders and all those what-have-yous, looking like unruly soap suds escaping from the fist of a dirty hand. 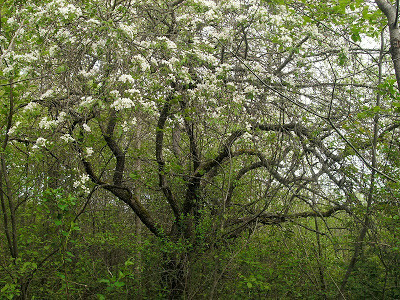 The wild apple trees are big and small, lanky and trim. Their blossoms are all big and white and blushing pink. Now at the other end of the spectrum as a light morning is darkened by a thick blanket of lush green. Green curtains have been draped across the trees, layered and shut tight, blocking out the woods. It is the opposite of winter. Funny how I now long for a thick blanket of snow to bring light to this dark. In the late 1960s, my family went to Wisconsin every fall to pick apples, to an orchard near the Illinois state line. We would go with two or three other families, leaving the suburbs in a caravan of station wagons on a golden September morn, driving through the country, idling in line at the orchard, eventually driving slowly between the rows of trees until we found the perfect spot to collect our bounty of McIntosh, Red and Golden Delicious, or Jonathon apples. With tailgates down, the moms got out picnic lunches and the dads set up the little portable black-and-white TV in order to watch football games or maybe baseball. There was one dad who always sent us kids off to find the biggest or smallest or reddest apple for a prize, and I believe there was something about throwing apples, or maybe not throwing apples … anyway, we went wild in the trees, climbing up, picking apples, eating apples, and probably throwing at each other any small, wormy apples we could find. One year my sister ate so many apples she threw up in the outhouse and we busted our guts laughing. The vomit was a huge pool of lumpy yellow and pink accented with bright, glossy chunks of red. And one year the back of my red stretch pants snagged on a branch hanging me up in a tree for a while until someone noticed and got me down. Apple trees are blooming. One of the newly planted, almost, but more so the old, established trees, of which I’ve discovered a new one in the middle of the front field. It is not large, but yet seems old with plentiful blossoms. Elliot walked out there with me as I explored, also going into the copse dominated by the huge old tree whose blossoms I can see from the cabin. It was magical in there. Maybe Sunday I’ll write about apple blossom time. This morning dawned at barely 40 degrees, but the sun warms the day. 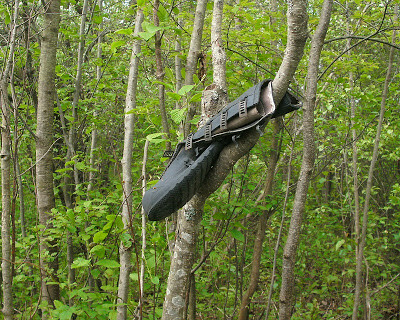 Last night the air was thick with the fragrance of blossoms, apple and choke cherry, and thick as well with mosquitoes. I stayed in, behind the screened windows. Friday the beech trees sent their seeds out into the world giving me the “snow” I longed for. The fluff now lays in little drifts around the yard and in the pots amongst the petunias. At the Lake Trout Festival in L’Anse yesterday, a good day selling beeswax, a cool breeze off the Keweenaw Bay, and an image I cannot shake: a person with purple hair eating blue food. Though calling cotton candy “food” may be a stretch. 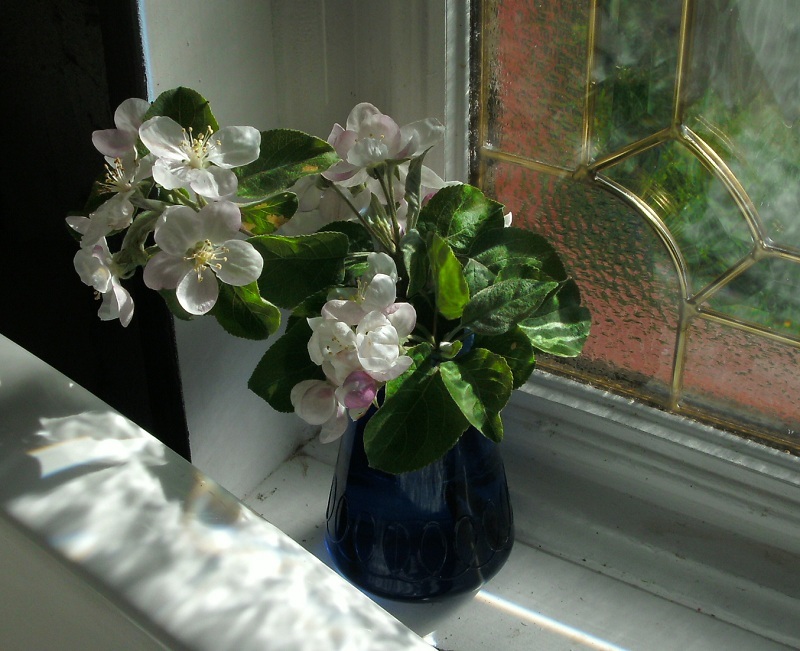 Apple blossoms in a vase in the bath. Yes, I’ve written about wild apples before. I hesitate to continue putting a link to this so-called wax book I am writing here on the sidebar. The book has changed in the past month or so as I began editing and rewriting offline. Typos have been (gasp!) caught, whole paragraphs have been deleted, added, rewritten, moved, there's a new chapter, sequence of chapters has been rearranged. None of these changes will be put online as the goal to have this thing on paper, suitable for purchase by any hapless caring soul passing by, is now within sight and so that is where much of my writing energy is being spent. Still, the online draft gives an indication of what to expect of the book, so, if you are interested, here is the link: http://www.storiesofwax.com/. NOTE: April 2019 - No more labels. Labels on previous posts remain, unmanaged and unmanageable. But we really don’t need no stinkin’ labels. The lists and links below will disappear by the end of May. I is for Beeswax: Air Cleaner? All content copyright Leslie Allen 2012 - 2019 unless otherwise noted or obviously not me, ie. music videos. You can reach me at: PeaPickleFarm@gmail.com.